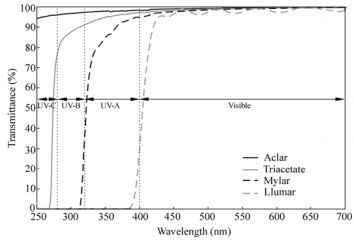 UVB radiation can be damaging to plant physiology and plant growth (Teramura and Sullivan, 1994), but solar visible radiation is important to the photosynthesis process in plants. This radiation (400 nm - 700 nm) is referred to as photo-synthetically active radiation (PAR). Both PAR and UV radiation within the solar spectrum have to be accounted for as the plant response to UVB depends on solar visible radiation exposure (Caldwell et al., 1995). PAR can have a direct influence on plant response to UVB radiation. Plant response to UVB radiation during growth can be a function of PAR levels. There may be an observed reduction in plant growth and mass with reduced PAR and increasing UV radiation, and different plant species may not respond in the same way. Rather than relying on large equipment that is too bulky for measuring solar spectral irradiance or broadband UV within a plant canopy, a combination of dosimeters can be used to evaluate the UVB and PAR incident on a plant canopy. A UVB and PAR dosimeter package allows the measurement of exposure at different locations within the canopy, or locations on the plant itself (Parisi et al., 2003). This is important as leaf angle, leaf reflectance, and shading will affect the UVB and PAR exposures on plants, as well as the relative proportions of UVB to PAR. The dosimeter package consists of two sensors: a polysulphone dosimeter to measure the UVB and a second dosimeter material to extend the wavelength range to measure the PAR (Parisi et al., 1998; 2003). The second dosimeter material, made from 35 mm AGFA 25 APX photographic film, responds to visible radiation which is easy to obtain, simple to process, responds to visible wavelengths. Additionally, the optical density (absorbance) can be measured using appropriate equipment, such as a dual beam spectrophotometer (Shimadzu, model UV-160, Kyoto, Japan) with maximum absorbance measured at a wavelength of 800 nm. The PAR dosimeter is constructed by cutting the unexposed film into 30 mm lengths in total darkness and mounting it in a black plastic holder with an opening of 10 mm x 20 mm. This opening is covered with cardboard when not exposed and also acts as a shutter. The exposure time of the PAR dosimeter can be adjusted using filters made of exposed and developed AGFA 25 APX film. Once the dosimeter has been exposed, the film is processed using a standardized procedure (Parisi et al., 2003), and the absorbance is measured. Calibration of the PAR dosimeter (Fig. 7.4) is used to determine photosynthetic photon flux by exposing a number of PAR dosimeters for varying periods of time and then comparing them to simultaneously measured visible spectral irradiance using a scanning spectroradiometer recording at 1 nm increments. The PAR dosimeter is dose rate independent, has a very small dark reaction (within 1% - 2% of original measured values after periods of one and seven days), is temperature stable from 200C to 45 QC and has a cosine response agreement of 13% or better for solar zenith angles smaller than 20° and up to 21% for solar zenith angles up to 60° (Parisi et al., 1998). The overall error of the PAR dosimeter is 20%.